“In practical terms, this means that the material with water layers is more efficient at storing charge, losing less energy,” Augustyn says. The paper, “Operando Atomic Force Microscopy Reveals Mechanics of Structural Water Driven Battery-to-Pseudocapacitor Transition,” is published in the journal ACS Nano. The paper was co-authored by James Mitchell and Shelby Boyd of NC State; Qiang Gao, Wan-Yu Tsai and Nina Balke of ORNL; and Matt Pharr of Texas A&M. The work was done with support from the National Science Foundation under grants 1653827 and 571800; an ORAU Ralph E. Powe Junior Faculty Enhancement Award, as well as support from the Center for Nanophase Materials Sciences, which is a DOE Office of Science User Facility and the Fluid Interface Reactions, Structures and Transport (FIRST) Center, an Energy Frontier Research Center funded by the U.S. Department of Energy, Office of Science, Office of Basic Energy Sciences. Abstract: The presence of structural water in tungsten oxides leads to a transition in the energy storage mechanism from battery-type intercalation (limited by solid state diffusion) to pseudocapacitance (limited by surface kinetics). Here, we demonstrate that these electrochemical mechanisms are linked to the mechanical response of the materials during intercalation of protons and present a pathway to utilize the mechanical coupling for local studies of electrochemistry. Operando atomic force microscopy dilatometry is used to measure the deformation of redox-active energy storage materials and to link the local nanoscale deformation to the electrochemical redox process. 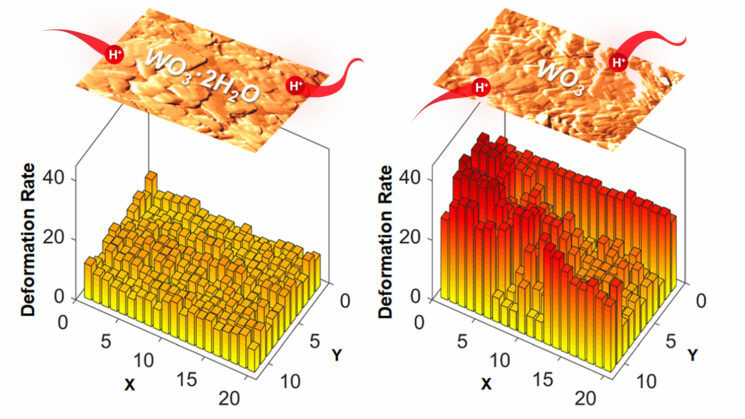 This technique reveals that the local mechanical deformation of the hydrated tungsten oxide is smaller and more gradual than the anhydrous oxide and occurs without hysteresis during the intercalation and deintercalation processes. The ability of layered materials with confined structural water to minimize mechanical deformation likely contributes to their fast energy storage kinetics.